Here's a little secret about the PSAT/NMSQT: the PSAT test is what we in the test preparation field call a general aptitude test. While some tests are looking to see what you already know, the purpose of the Preliminary SAT/National Merit Scholarship Qualifying Test (NMSQT), offered by the College Board, is to test your ability to learn. The goal of the PSAT test is to use a standardized testing process to create an objective assessment of a test taker's knowledge and skills. You can succeed on the PSAT test by preparing in depth for the different question types and being able to take difficult questions and break them down into easier parts that you can quickly solve. Repetition and thorough preparation is a process that rewards those who are serious about being prepared, which means that succeeding on the PSAT test is within the reach of virtually anyone interested in learning how to handle any question they might face on test day. This is great news! It means that if you've been worried about your upcoming PSAT test, you can rest easy IF you have a good strategy for knowing what to study and how to effectively use repetition to your advantage. If you tried to memorize every single possible thing you can for the PSAT test, the field of possible things to review would be so huge that you could not hope to cover everything in a reasonable time. That's why we created the PSAT Exam Flashcards Study System: we have taken all of the possible topics and reduced them down to the hundreds of concepts you must know and provided an easy-to-use learning method to guarantee success on the PSAT test. We wanted this system to be simple, effective, and fast so that you can succeed on your PSAT test with a minimum amount of time spent preparing for it. It's easy for a friend to help you study. They don't even have to know anything about the PSAT test; if they can read, then they can quiz you with our PSAT flash cards! Now, let us explain what the PSAT Exam Flashcards Study System is not. It is not a comprehensive review of your education, as there's no way we could fit that onto a single set of flashcards. Don't get us wrong: we're not saying that repetition will automatically result in a passing PSAT test score- you have to have some innate ability as well. However, without exposure to the question types and concepts, you cannot possibly hope to do well on the test. After all, it's hard to do well on test or prepare for it when you don't know what's going to be on it. PSAT Exam Flashcards Study System is a compilation of the hundreds of critical concepts you must understand to pass the PSAT test. Nothing more, nothing less. Remember, this is just a small sampling of the topics covered in our system. Overall, you get our premium-quality flashcards covering everything you'll need to succeed on the PSAT test. PSAT Exam Practice Test Questions: Think you're ready for the PSAT test? Test yourself using our practice test questions. Find out if you're prepared or if you need to head back to the flashcards for another review. Use our practice test questions to make sure that you're not caught off guard on test day! Our PSAT practice test questions give you the opportunity to test your knowledge on a set of questions. You can know everything that is going to be covered on the test and it will not do you any good on test day if you have not had a chance to practice. Repetition is a key to success and using practice test questions allows you to reinforce your strengths and improve your weaknesses. Detailed answer explanations are included for each question. It may sound obvious, but you have to know which questions you missed (and more importantly why you missed them) to be able to avoid making the same mistakes again when you take the real test. That's why our PSAT practice test questions include answer keys with detailed answer explanations. These in-depth answer explanations will allow you to better understand any questions that were difficult for you or that you needed more help to understand. Study Skills teaches you everything you need to know about studying, so that you can maximize the effectiveness of the time you spend in preparation and are guaranteed to get the results you deserve on test day. Study Skills is an in-depth, comprehensive study manual and is here available completely free along with your regular purchase of a copy of our PSAT Exam Flashcards Study System. The Official Cutoff for National Merit Scholarships: Go behind the scenes at the National Merit Corporation and see what your score REALLY means regarding your chances for a National Merit Scholarship. Prefixes and Suffixes: For those crucial words that you don't recognize on the sentence completion section, it's always a huge help to be able to dissect the word into its components and piece together a definition without any prior knowledge of the word. Using our exclusive list of the prefixes and suffixes you are most likely to encounter, you'll be an ace at breaking down the toughest words. The PSAT Test Words You Must Know to Ace the Sentence Completions: While the new PSAT test doesn't have an analogy section and learning vocabulary is less important, it's still a huge help for the sentence completion section. Therefore, we include a list of these high-frequency words that you can review and memorize at your leisure to maximize the chance you won't get hit off-guard with words like "retinue" and "educe." PSAT Quick Reference Guide: Ever heard of the 80/20 rule? Guess what - it applies to studying too. Eighty percent of the stuff that you need to know on the test can be learned in twenty percent of the time. That's why you need our PSAT Quick Reference Guide! Our PSAT Quick Reference Guide is condensed study material. We've taken the basics of the test and boiled it down to the most important concise facts and need-to-know information. Our goal was to create a set of cheatsheets that you can print out that would allow you to do a quick review in a short amount of time. Unfortunately our cheatsheets don't give away the actual answers to the test, but they do the next best thing. They give you that basic review of the most critical things that you need to know to be successful. Undergraduate School Secrets is written by a team of undergraduate students and admissions experts, who know what is required to get into undergraduate school and then be successful. Undergraduate School Secrets normally retails for $29.99, but is here available completely free along with your regular purchase of a copy of our PSAT Exam Flashcards Study System. 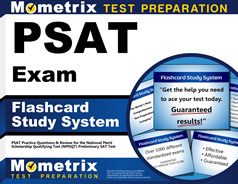 So go ahead and order your copy of the PSAT Exam Flashcards Study System from this site today. Read them, study them, and profit from them. If you don't think they are helping you prepare for your PSAT exam, you can return them for a 100% refund of your product price, no questions asked. If you would like to order through the mail, click here to order PSAT Exam Flashcards Study System by check or money order. *PSAT/NMSQT® is a trademark registered by the College Board and the National Merit Scholarship Corporation, which are not affiliated with, and do not endorse, this product.